Even though it’s still snowing here in NW Pennsylvania, I know Spring must be coming eventually, right? Right! So in anticipation of that great upcoming Spring and fabulous Summer days ahead I am getting ready by preparing some early yard decor for my favorites: my birds. 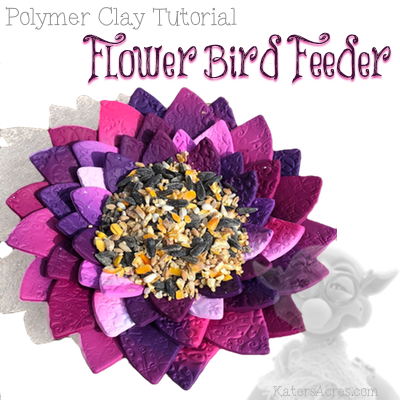 This flower bird feeder can be made as simple as or intricately as you’d like. Do NOT add any paint, mica powder, or anything that needs sealed. Polymer clay is highly weather resistant and can stand up to a variety of weather elements. While adding these may seem like a great artistic touch (and it is) it’s not the best thing for the elements. Do not forget the holes in the bottom of the flower. These are important to let any water drain from the bird feeder so the bird seed doesn’t spoil and rot. Skinner Blend Tips: You will need to keep reworking your blend as you use and make this blend. See the worksheet in the download if you are unsure how to make a Skinner Blend. Feel free to play with color! Make your petals in any variety of colors you’d like to add interest and color to your flower. Make this a hanging bird feeder instead. Add holes in four petals on opposite ends of the flower and hang as a hanging feeder. Set it outside and watch your birds enjoy eating from your new fancy, homemade bird feeder. Don’t forget you can make Natasha Beads from your scraps!